Finished size approx. 54-56 cm in length for adults. To make smaller, remove one or two of the 4 row pattern. For a larger neck buff add in an extra 4 row repeat. The needle size is 20 mm and not 19 mm as above (20 mm wasn’t on the drop down box). The neck buff used a full 100g ball of King Cole Riot chunky. Check your tension if making with a substitute yarn. 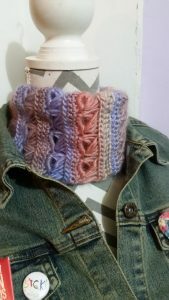 This pattern uses 2 strands of DK cotton worked together on a 3mm hook. You will only need approx. 20g of yarn. The final round is made up of crossed trebles. 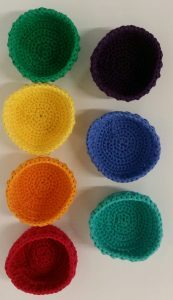 The bowl size can be varied by adjusting hook size, yarns and number of strands used. Use a smaller hook for the foundation dc row. Worked top down, in the round, turn at the end of each round, turning chain is not counted as a stitch. 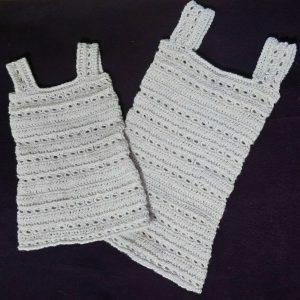 I tried the 6-9 months size on my niece yesterday and realise that the straps could do with being buttoned rather than fully stitched on both sides so I will be making an adjustment to the pattern and uploading a revision.